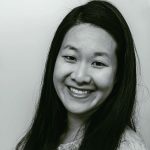 Published Jan 18, 2018 By Julia 4 CommentsThis post may contain affiliate links. 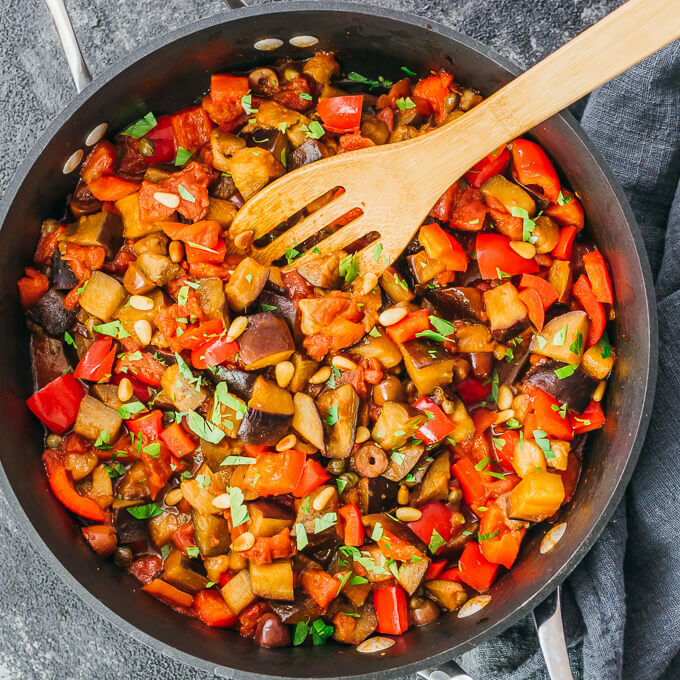 Whether you enjoy eggplant caponata as a main entree or a side, hot or cold, it’s always a crowd pleaser and potluck favorite. It has complex flavors that are savory and earthy, yet also tangy from the sharp kalamata olives, lemon juice, capers, and balsamic vinegar. If you have a year-round vegetable garden, you’ll love using fresh garden veggies to add to this dish. 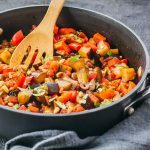 My version of eggplant caponata is made on the stovetop as a one pot dish, where various ingredients are added to the pan in succession as they’re stir fried and cooked. 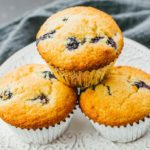 These kinds of recipes are forgiving in terms of ingredients and quantity, so you can easily add your favorite ingredients to make it your own. 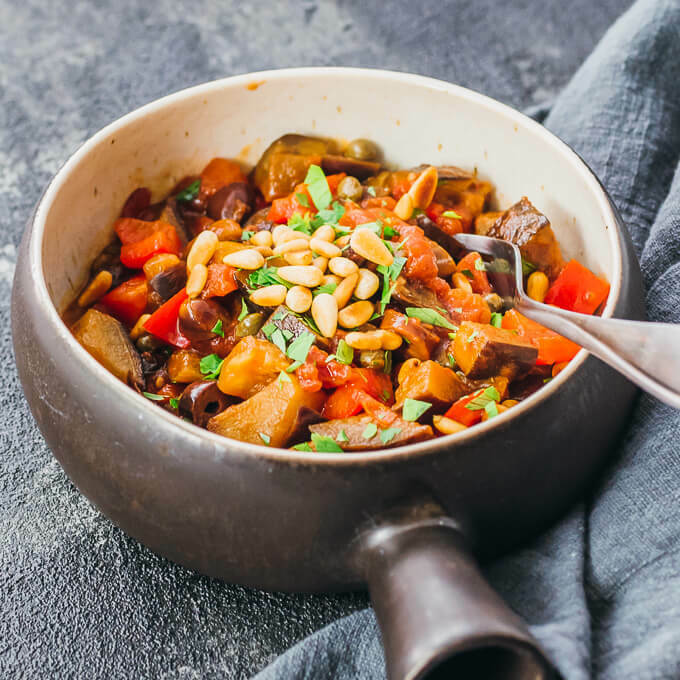 Eggplant caponata originated as a Sicilian dish with chopped fried eggplant and capers, and there are numerous local variations that include olives, carrots, green bell peppers, pine nuts, and raisins. There are also similar versions in Neapolitan and Tunisian cuisine. I was inspired to make this dish after stumbling across an Ina Garten recipe, where she makes eggplant caponata via oven roasting and enjoys it as a dip with pita bread. 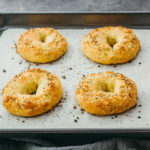 My version is completely pan fried, and the ingredients are cooked until still chunky but not soft enough to form a dip. I start by toasting pine nuts on a hot pan, which gives them a sweeter and more intense flavor. Then I cook the eggplant with a generous amount of olive oil, as eggplant is very absorbent and soaks up oil like a sponge. As the eggplant softens and becomes tender, I add in the remaining ingredients until everything is hot and cooked through. 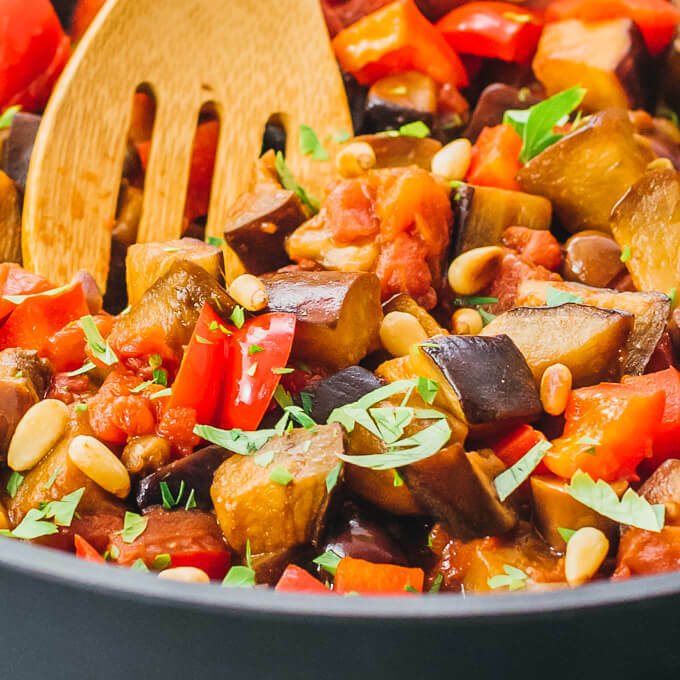 Personally, I enjoy eggplant caponata by itself and hot. 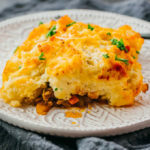 I think it’s most flavorful while hot compared to cold, and if I have more than one serving, it makes for a calorie-light but filling dinner. A simple and easy eggplant dish that can be enjoyed hot or cold. Perfect as a side dish for potlucks. Add pine nuts to a small pan over medium heat. Cook until golden in color, a few minutes, frequently stirring to prevent uneven cooking. Set the toasted pine nuts aside. Add eggplant cubes to a 3 quart or larger pan. Drizzle olive oil on top and stir together. Cook over medium heat until the eggplant cubes are brown and shrunken, 10 to 15 minutes, stirring frequently. Add diced tomatoes including the liquid in the can. Stir everything together. Cook until the eggplant is soft, 5 to 10 minutes, stirring occasionally. Add bell pepper, olives, capers, lemon juice, and balsamic vinegar. Stir together and cook until the bell pepper is tender, about 5 minutes, stirring occasionally. Top with fresh parsley and toasted pine nuts. Serve while hot, or refrigerate to chill. MMMMMMMmmmmmm. What a beautiful idea. I wish my husband ate eggplant! But i can just make it for myself. Topped with an egg?!! You might just have converted me from an eggplant hater to an eggplant lover, ha!